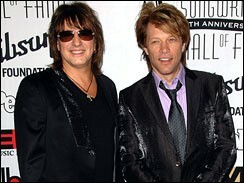 Bon Jovi is kicking off a two-year tour, called “The Circle Tour,” Friday night in Seattle’s KeyArena. The Grammy Award-winning band will then take the show on the road and perform 135 shows in 30 countries. The tour will also include the kickoff of New Meadowlands Stadium and a residency at London’s O2 Arena. Bon Jovi lit up this year’s Grammy Awards with its 1986 hit, “Livin’ On A Prayer,” but there was a twist. For the first time in Grammy telecast history, fans had a say in the show’s lineup. So, fans cast their votes, and decided that “Livin’ On A Prayer” was the number one song they wanted to hear. Fans have always been a priority for the New Jersey natives, but this time around they want supporters to share in the performance. Fans can upload videos of themselves performing “Livin on a Prayer” and the best performances from each city will be chosen to be featured on the local venue’s giant video screens, while the band is on stage playing the song. Bon Jovi’s 11th studio album, “The Circle,” has been a hit at home and around the world. It debuted at No. 1 in numerous countries, including the U.S., Canada and Japan, with Top 5 debuts throughout Europe and the UK. The band has sold more than 120 million albums, and performed more than 2,600 concerts in more than 50 countries before more than 34 million fans.